Listen to an interview with Author/Publisher Mark Johnson and Suzanne Lieurance at Book Bites for Kids, provided by The National Writing for Children Center. 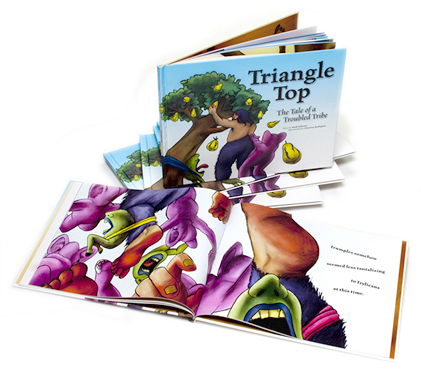 The best picture books have something for everyone: illustrations to delight the eye, word sounds to tickle the ear, and storytelling that is both entertaining and meaningful. All of these qualities are charmingly—as well as disarmingly—expressed in Mark Johnson’s new book Triangle Top: The Tale of a Troubled Tribe. While children will enjoy the author’s alliterative story about a group of creatures that encounter a major challenge to their way of life, adults will find themselves pondering themes such as the rights of the individual vs. the common good, the importance of independent thought, and the dangers of clinging to routines that are no longer useful. These intimations provide a certain heft to the plot, yet it is the tribe’s failure to communicate its history that gives this story a gravitas that both children and adults can appreciate. The story begins with a lively description of how the tribe of the Trylicans gathers the fruit of the trumple tree. Trumples are the tribe’s economy, their only source of food, and each type of creature within the group plays a very specific role in the procurement of trumples. Tweebles, who are walking eyes, scout for the trumples. When they find a trumple tree, they tie a Twarfer to it so that it will begin shouting, or “twarfing.” Twarfers are walking mouths, with no eyes or ears, and the illustration of one of them tied to a tree, mouth wide open in protest, reveals one of the story’s central ethical quandaries: Do the means justify the end? Even young children are likely to both giggle at the absurdity and comment on the unfair treatment of the Twarfers. Copyright © 2011 Penelope Press. All rights reserved.